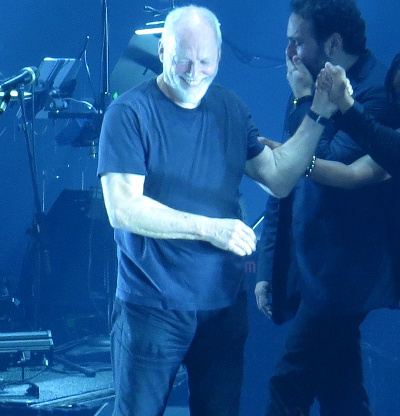 Pink Floyd news :: Brain Damage - David Gilmour - Happy Birthday! David Gilmour - Happy Birthday! Our very best wishes, and many happy returns, to David Gilmour today (March 6th), who is celebrating his 72nd birthday! Born and raised in Cambridge, David became involved with various bands in the area, principally Jokers Wild who were a popular draw when they played, before joining Pink Floyd in 1968. More recent years have seen David concentrating on his solo career, and helping out chums on their musical projects on an ad hoc basis - such as appearing on stage with Phil Manzanera at the legendary Ronnie Scott's Jazz Club, with Amadou & Mariam at the Crisis "hidden" charity show, and the Douglas Adams 60th Birthday concert at London's Hammersmith Apollo amongst other things. Of course, 2015 saw the return to his own music with the release of Rattle That Lock, his most recent solo studio album, which was accompanied by a tour of Europe, and North and South America. The tour took in some quite unusual and spectacular locations, perhaps the pinnacle being a return to the amphitheatre at Pompeii for a pair of shows, which were filmed for release, shown in cinemas worldwide, then released for home viewing and listening to much acclaim.